Sun 1 Nov: I am very late with my diary. Just writing up the last 2 months. And I’m going to skip and tell you only the major events. September was very busy. Contributoria the newspaper I edited – this issue on the environment and our politicians are criminals campaign– came out, and I was pleased. The graphics were exciting. Contributoria was affiliated to the Guardian but now they want to cut loose so as to have complete editorial freedom. Good luck! I am always working to improve the structure of our company and I had a visit from lovely people whose company is inside the Scottish border and who weave our blanket and cloaks. 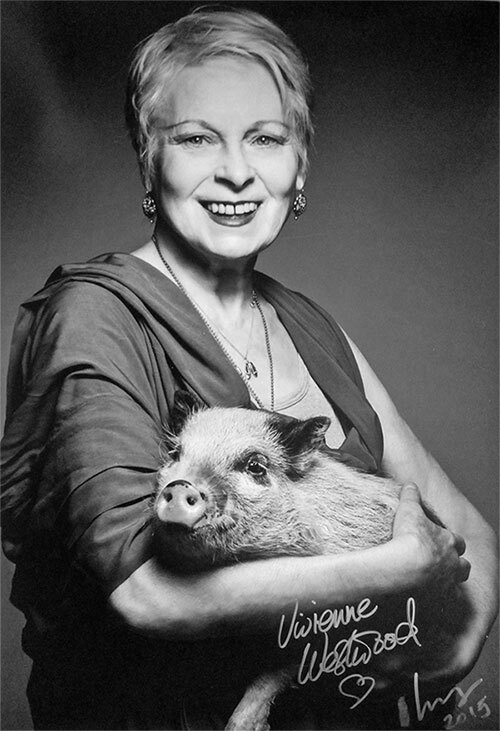 And I took part in dear Tracy Worcester’s film to campaign against the terrible suffering of animals in pig factories. 90% of your bacon comes from them – 3 major animal monopolies. Her campaign is farms not factories. You can stop this by how you shop. 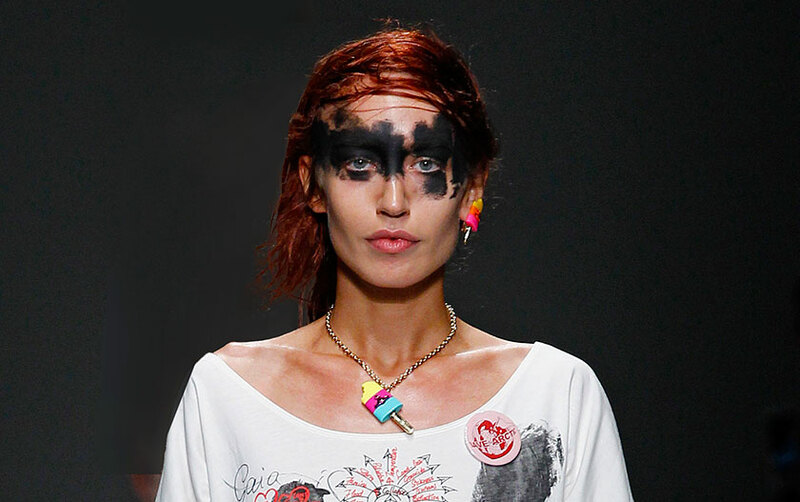 Take the Pig Pledge – We did the T-shirt and used it in our fashion show. Or be vegetarian like me. Lush campaigned and raised money, against TTIP. We did the packaging for the Lush campaign and the shops gave away copies of Contributoria. I went to 6 evening events to support other NGO friends – fundraising. 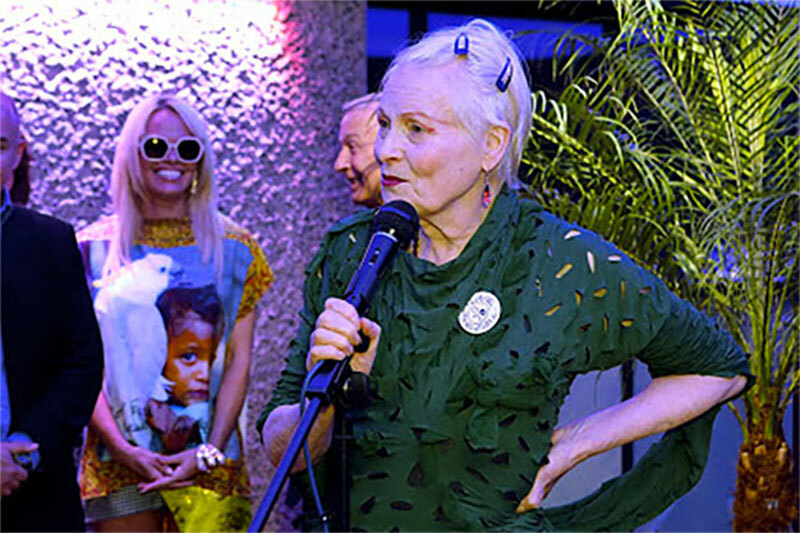 One was a film about Mahlia and her work and one was our own event with Cool Earth which raised £400.000. In between we did our Red Label Fashion Show. The most important philosophical question ever asked is “what is a good life?” A good life is one which mirrors the world. At this point in time it’s incredibly important, also, to be political because we face incredible danger from our politicians and we’ve got to stop them! They cause climate change and war. The worst thing that politicians do is to pretend that nothing has changed when in fact everything has changed because the human race faces mass extinction, and we face it really soon, it could happen that by the end of this century there are only 1 billion people left. Why do the criminals (politicians) want to do that- because it enriches them, but every one of their policies is a crime against humanity. I am here to say something like a crazy person because ‘the criminals’ aren’t saying it, they’re all pretending everything’s normal but they’re the ones who are really crazy because they’re taking us to mass extinction and we have to do something. I’ll pick out one more special detail here. It’s about Lizzie Jagger and her walk. Though she’s been educated mostly in England she sounds just like her mum – from Texas. She is charismatic with such a giggle filled with happiness. You can’t get enough of it. This is her walk as Andreas described it: The walk of Lizzie Jagger! She exudes presence. – As if the Roman legions had been sent out in advance to prepare for her advance – the path of her triumph. She proceeds without molestation, one step at a time. She think about every step, when she turns a corner she thinks, now I turn the corner, takes a little step back to adjust her position, hands on kidneys at the back, pushing herself forward. And the emperor went forth and the multitude acknowledged her. I never thought I’d see the day! USP 1 Coleman is once again on lock down. I cannot express enough the deep concern we all have for Leonard. As we reported last time his health deteriorated and he has been quite sick because of it. Now, only a few weeks later, they are once again locked down, Leonard has not recuperated from the last lock down. Please pray for him and send him a note letting him know the world is watching. Then the Gold Label. These shows take preparation. We went to Paris on Wednesday for the show on Sunday. 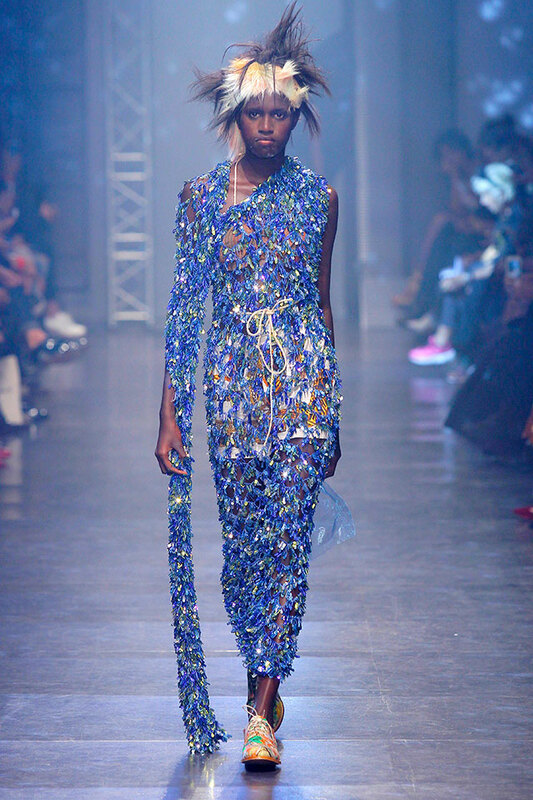 On Tuesday the night before we left I was exhausted but I had one thing left to do, I had promised Andreas to make a dress out of a long elastic net of 2 inch hole mesh and embroidered with sequins. The idea was to stretch it out onto the stand/dummy/mannequin then pull it round into a tube and “sew” the sides together by pushing a strip of gossamer fabric through the holes. I pulled the elastic net out of the bag. It came out all together like a bouncing solid pipe, a snake of sequins. I threw it on the stand, I didn’t know where to begin. I couldn’t. Andreas wound it round his neck, hanging like a boa and played around with that idea. He was on form. He then pulled it around him and held it and walked with it and posed. This is the dress he made in 5 minutes. You could do anything with this net. It was like chewing gum, it fitted anything and it stayed where you put it. The hardest thing is fashion is the right use of fabric. You can play with it, wear it many ways. Just pick up the boa train and stretch it round your head and shoulders if you want. Andreas did this Gold Label collection solo but of course with our team. I hardly touched it. When we arrived in Paris on Wednesday afternoon Andreas was relaxed and in a good mood, though tired from hard work. And now I’m going to tell you something about love which is an unusual thing for me to do. Yasmine’s shop, selling her underwear is next to one of the best flower shops in Paris. We met her with the idea to get something to eat and for Andreas to get flowers for our hotel which is in the same street, Rue de Richelieu, Andreas always does this. He loves flowers, it’s a routine. I told Andreas to buy these white freesias. I love flowers in season and they were just beginning to come out and they smelt with a very concentrated spicy freesia smell; the stems were especially green and strong. The florist wanted to do her thing and add more flowers and I kept saying no. Andreas thought I had a cheek telling the woman that we just liked the single bunch of freesia. He looked upon her as a priestess of flowers whose authority was sacred. So we ended up with the freesias with just their heads showing and embedded amongst a bouquet of white blossoms with woody stems. While we waited for our light meal in a little café, I said 2 or 3 times, I couldn’t help it – I don’t like the flowers. Andreas got up, said I was terrible, “I worked my arse off.”, stuck his hand in the flowers, broke off their heads and walked out, leaving his lunch untouched. We did find him later and I apologized and we went to the showroom. The next day I stayed in our room writing the press release and he left. Half an hour later the maid came to the door with a vase of flowers – just a bunch of the same white freesias. I had not realized before that Andreas liked me, loved me so much. Sun 4 Oct: I was working backstage during the show, checking the girls as they went out. They looked amazing. Also the venue and lighting, the music! I still haven’t watched the video – or that of the Red Label. I’ve been so busy since. Mon 5 Oct: Andreas and I met Paul Watson and his wife (pronounced Y a n a) in his local cafe. One of the most important meetings in my life. There is a lot of particular emotion in this written piece, very different to most entries on this blog. You can feel angst in-between the busy schedule of wanting to share the past two months and maybe something else… It’s as if something significant is about to happen in your world Vivienne.